Advanced Relationships are a way to "elevate" certain relationship types within your Databank. When two Member records are grouped by an elevated relationship the relationship displays prominently on the Member record, changes to one record can update the other, and can be used to combine contribution information and generate "householded" mailing lists. Member Groupings are an advanced feature of your Databank. To activate this functionality, please contact your client representative at thedatabank. If you are new to using relationships in your Databank, read more about using the Relationship Tool here. 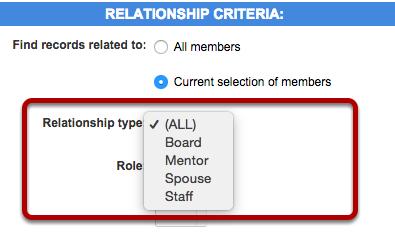 Up to two of the relationships available may be designated as "grouped". The grouped relationships will normally be configured during the setup process. If you want to change the grouped relationships or create a new grouped relationship, please submit a support request. When selected, key data fields will be updated to the grouped Member record. 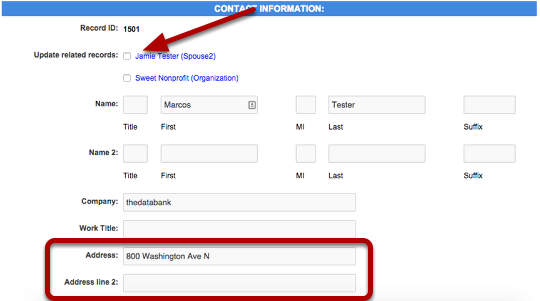 While these fields can be customized, they typically include address, city, zip code and state. Read more about making a Fundraising Roster here.